You are here: Home › Education › Field Days › Cover Crops underground…I was not disappointed, I was a bit surprised! The Crimson clover had dense roots and we found a number of them at over 40″ deep. 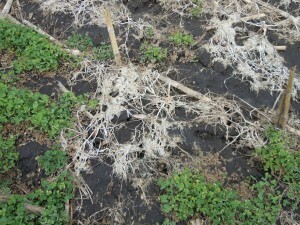 At cover crop field days over the past few weeks many interesting aspects of cover crops were revealed. One reminder about cover crops; it is NOT what is above ground that is the best indicator of success. Please take a shovel with you when you evaluate cover crops and dig up some roots so you get the real story. The radish tops were still quite eveident and some of the holes had yet to fill in completely. This field at Four L Farms had tremendous growth from the radishes and crimson clover last fall. The clover survived the winter beautifully. First, we found deep roots from multiple species. While we expect to find deep roots from annual ryegrass we continue to be amazed at how deep other species are penetrating. 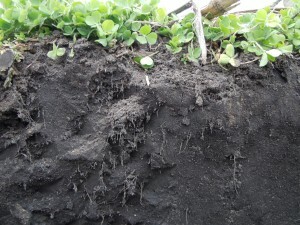 At Four L Farms near Francesville, IN we may have set a “world record” by finding 40+” deep roots from crimson clover. We also found cover crop radish roots 40″ deep and annual ryegrass roots 54″ deep (as deep as the pit was dug). When the pit walls collapsed I was quite surprised to see many root channels deep into the soil. I had never seen anything quite like this! Next, we found earthworms in some fields and not in others. I think that this was a function of soil temperature and moisture. (The soil temperature averaged 47 degrees at a 4″ depth). However, I’m not sure that is correct. We found a pretty good number of worms where we had more manure applied at Four L Farms on the annual ryegrass. Typically crimson clover and radishes will have more earthworms around their roots than annual ryegrass…but this spring that was not entirely the case. While we found worms around the radishes we found less than I expected around the crimson clover roots (again, no manure was applied in that field). I always get a rush of excitement when we start digging pits so we can see what God did over the winter with our cover crops! In the fields in Lake County, Indiana we were looking at fields that had never had cover crops in them before. The producer is following corn and going to soybeans on most of the 900 acres he had flown on. The mixture of cereal rye, annual ryegrass, and GroundHog Radish has looked good since last fall. We were pleasantly surprised by what we saw there. 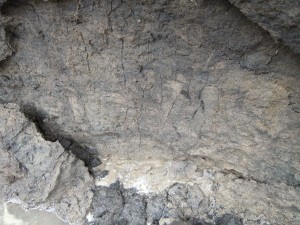 Nearly 20 producers came to the field day and saw root channels along the side walls of the pit. Actually the pit collapsed and revealed an awesome display of root channels like I had never seen before. I probably enjoy looking at cover crops way too much. With the response from the producers looking at the root pits, I think most of them are getting excited too. 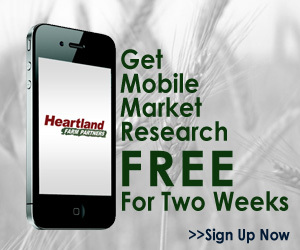 ← What herbicides can I use and still plant cover crops? 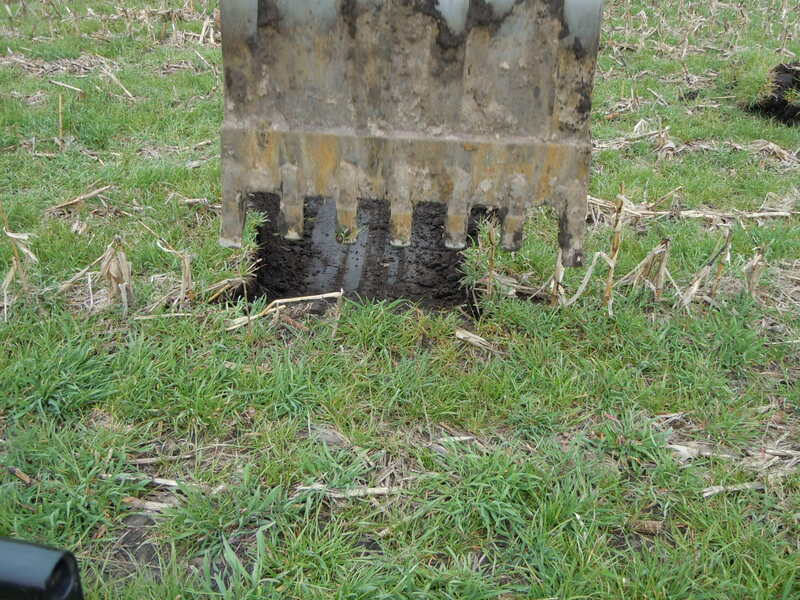 One Response to Cover Crops underground…I was not disappointed, I was a bit surprised! I don’t believe I just found this website! I am a plant ecologist who has been promoting cover crops for wildlife and farms for years, but just started using them in my own garden. Some great resources here…..I’ll be back!